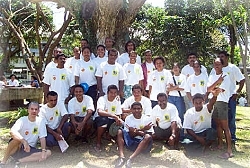 The University of the South Pacific (USP) is the premier provider of tertiary education in the Pacific Region, and an international centre of excellence for teaching and research on all aspects of Pacific culture and environment. Established in 1968, USP's academic programmes are recognised worldwide, attracting high calibre students and staff from throughout the Pacific Region and internationally. The University has 12 Member Countries: Cook Islands, Fiji Islands, Kiribati, Marshall Islands, Nauru, Niue, Samoa, Solomon Islands, Tokelau, Tonga, Tuvalu and Vanuatu which span across 33 million square kilometres of ocean. The Department of Land Management & Development supports a vocational discipline that analytically synthesizes environmental, economic, geographic, legal and social information for prudent decision making by regional governments, organisations and individuals. We offer Certificate, Diploma and Bachelor of Arts Majors in "Real Estate" and "Land Use Planning" and are developing new offerings in "Geomatics". The Department also offers a Postgraduate Diploma in Real Estate, and Research Masters and Doctorates in Land Management and Development. Given the customary nature of land ownership in the Pacific region, the primary focus of departmental research is centred on land tenure related issues.